ORACLE Racing blog: Stop press! 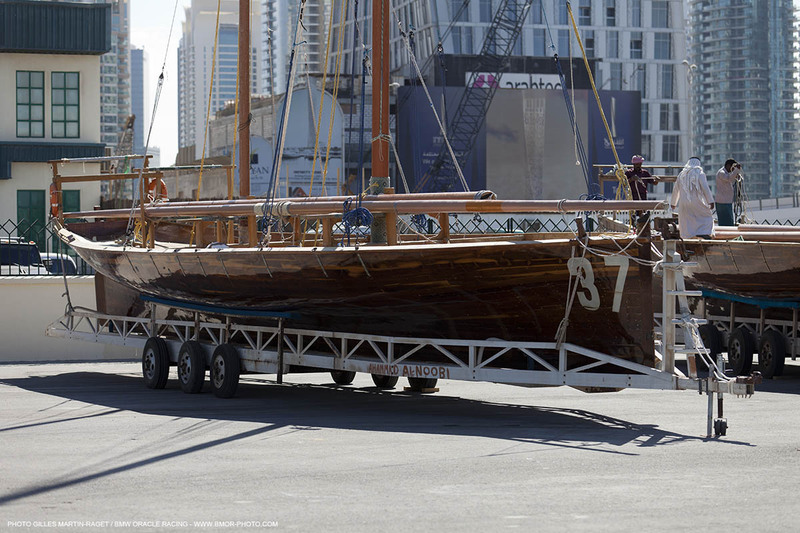 No one knew, but BMW ORACLE Racing’s new yacht for the 34th America’s Cup arrived in Dubai today. 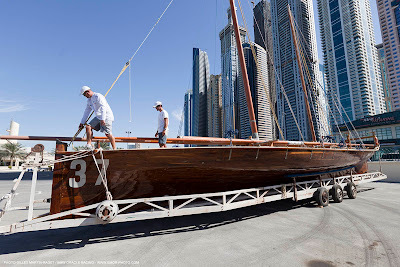 Looking strikingly similar to a Dubai dhow, crewmembers were seen inspecting the sleek wooden craft, which is built of teak and may only be coated in varnish. In truth, the dhows are in Dubai for tomorrow’s Heritage Day regatta. Dhow owners for the first time have invited non-Arab sailors – crews competing in the Louis Vuitton Trophy Dubai – to race aboard the 60-foot yachts. There are no motors aboard these vessels; all power comes from human muscle, which burns when hoisting the nearly 90-foot boom fore boom to the top of the masthead.